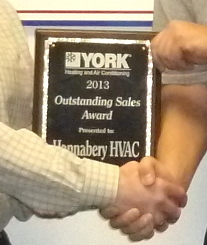 (ALLENTOWN, PA) - January 17, 2014 - Local business Hannabery HVAC receives Outstanding Sales Award for 2013 from York Heating and Air Conditioning. Zack Nicolai, owner of Hannabery HVAC, accepted the award from YORK Branch Manager Tony Natale. Also in attendance was YORK Sales Manager Marty Fisher and YORK Salesperson, Mary Ellen House. Also accepting the award was Dave Holschwander and Tom Bowen - Comfort Specialists with Hannabery HVAC. The award was presented for the highest sales volume and the highest sales volume increase over the previous year. York provides heating and air conditioning systems for residential and commercial use. This article may not be copied or used without our written consent.